So how strong are Spiegler Brake Lines? 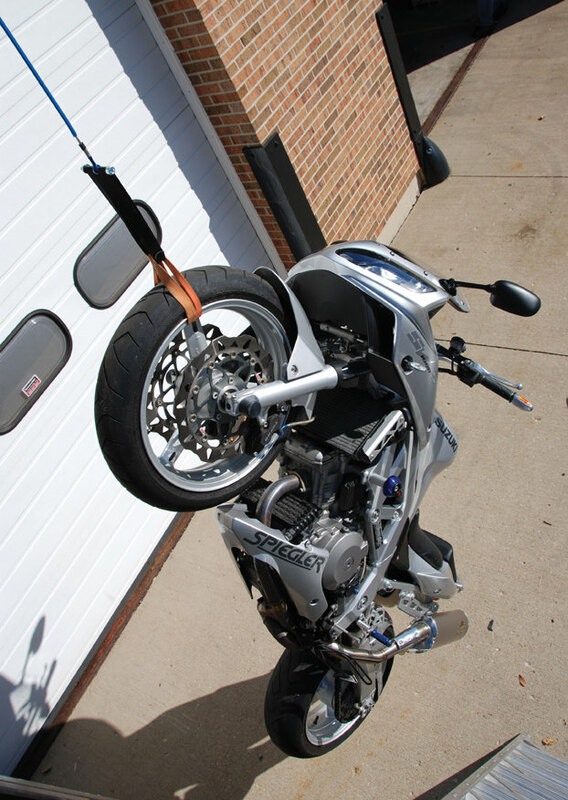 We know from our own testing how many pounds of pulling force a Spiegler Brake Line can handle. We could quote you a number and leave it at that. . . factual but boring. Our ever ingenious President, Matthias Schaub, came up with an idea, "Let's hang a bike in the air using one of our brake lines". So, we attached one end of a single Spiegler Brake Line to the front wheel of a Suzuki SV1000S weighing 460 lbs and the other end to fork lift operated by the famed racer Robert Jensen. Slowly we raised the front wheel until the entire bike was free of terra firma. For the next 14 minutes the bike hung in the air while we scrambled about taking video and still photos to record the event so we could share it with you. Then we lowered it to the ground. So how strong are Spiegler Brake Lines? Strong enough to put your confidence and trust in our performance.